Joy Creek Photo Archive (c) all rights reserved Also known as 'Silver Mist' this diminutive, grass-like, evergreen groundcover has very narrow leaves that are irregularly striped with white lines giving it the misty appearance refered to in its English name. 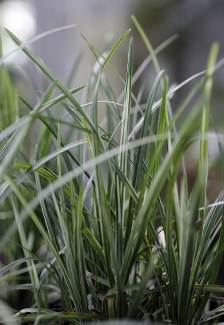 Although Ophiopogon japonicus 'Kijima Fukiduma' may look like grass, it is really a lily relative and should not be mowed. Over time its tuberous roots and stolons will spread out creating a dense cover that is ideal under shrubs and trees. Tiny summer flowers will eventually set dark rounded berries.